The TradeRev app allows dealers to start real-time auctions right on the showroom floor. 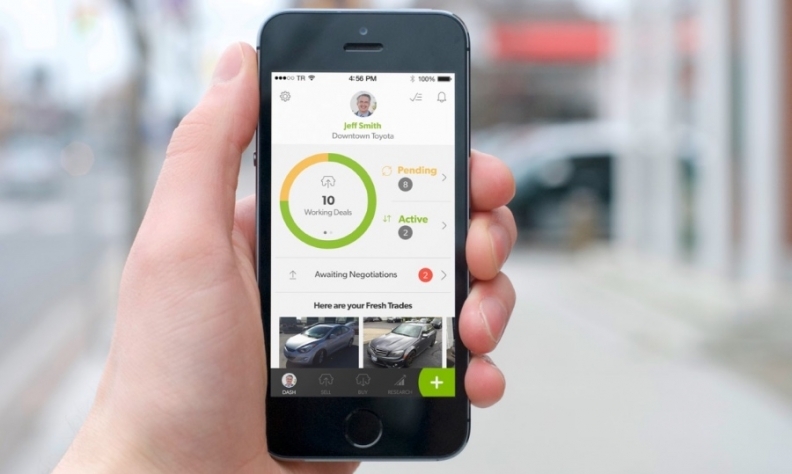 TORONTO – TradeRev, which offers an online and mobile app for dealerships to buy or sell used vehicles in real-time auctions, has announced a series of exclusive relationships with dealer groups. The deal adds about 100 stores across Canada to the more than 2,500 already using the service. The new partnerships include Dilawri Group of Companies, AWIN Group, The Humberview Group, Open Road Automotive Group, Weins Canada Inc., and The Mierins Automotive Group. The agreements are in collaboration with vehicle auction company Adesa, which owns 50 per cent of TradeRev. Dealers enter vehicles in a real-time, one-hour online auction. When a winning bid is accepted, they can opt for floorplan financing or electronic funds transfer through TradeRev, with funds transferred within 48 hours of lien release. The company also offers post-sale services, including title management and vehicle shipping options. The auction allows dealers to show a customer the actual trade-in value, rather than trying to determine it. “Data is great, but money is better,” Endras says. “When the customer is (in the showroom), the dealer says, ‘We’re going to launch your car coast-to-coast, and they’ll bid on your car when you’re here.’ They can see the true market value, and the dealer can work that into the sales talk. The new dealer groups coming into the program will add tens of thousands of vehicles to the available inventory on the auction app, the company said.